NSLI-Y Rabat led a session at the YES Inbound Pre-Departure Orientation at the end of their second week. In the picture on the right, NSLI-Y student Reagan is presenting to future YES students about family life in the U.S., and other students presented about social life, extracurricular activities, and academic life in the U.S. After the presentations, all of the students broke up into small groups and talked about history, politics, and modern life in the U.S. 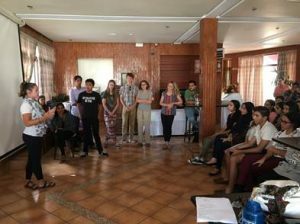 The NSLI-Y students answered many questions the future YES students had about what they might experience when they arrive in the U.S.
NSLI-Y participants practicing skits and playing games with Tajik Camp America counselors on July 15. 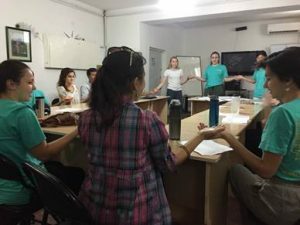 Students have been preparing skits, songs, sports, and games to assist Camp America counselors plan their programs in rural parts of Tajikistan as a means to acquaint Tajik youth with American culture. 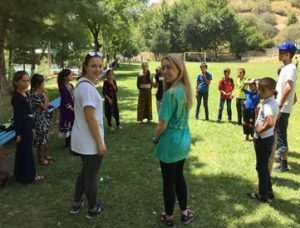 On July 30, NSLI-Y participants in Dushanbe visited the Camp America site in Romit (southwest Dushanbe) to lead games and activities for Tajik campers and help with English lessons. Camp America is a week-long American-style camp for local youth between the ages of 9 and 14 years old from across Tajikistan. The camp is sponsored by the U.S. Embassy in Dushanbe. 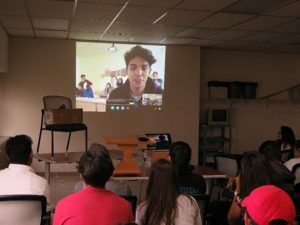 On Wednesday, July 19, the NSLI-Y Russian participants held a teleconference with students in the STARTALK-funded Pushkin Summer Institute in Madison, Wisconsin. Pushkin Summer Institute students asked questions (in Russian) about classes, food, host families, and free time. The NSLI-Y students shared their impressions with the STARTALK students and encouraged them to apply to the NSLI-Y program next year. This past weekend participants volunteered for several language exchanges with local students. 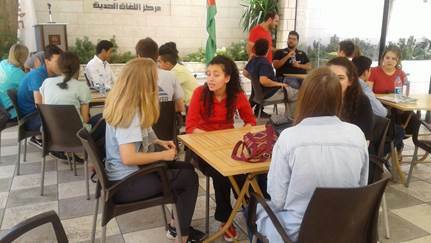 On Saturday, July 29, NSLI-Y students practiced their Arabic and taught some English with local students on the Modern Language Center in Amman. On Sunday, July 30, NSLI-Y Participants had the opportunity to meet alumni from another ECA exchange program—the YES program. Current NSLI-Y participants and YES program alumni met for a language exchange on Sunday afternoon at the Embassy’s American Language Center. NSLI-Y students also volunteered at a clothes bank in Amman by sorting clothes that were then distributed to local communities in need. This was a collaborative activity with the English Access Microscholarship Program.